Recently, the dairy industry has experienced quite the shift in the amount of milk that they sell per capita. The realization is that many more households are drinking less milk than they did in previous years. There could be a long list of explanations that explain this fact. Milk, and dairy in general, has been largely thought to be unhealthy and many even react badly to it when they consume it. Between 2011 and 2014, there was an almost four percent decrease in the amount of milk sold, but comparatively, there was an increase of almost 30 percent in plant-based beverages sold between 2010 and 2015. This means that more people are becoming incredibly health conscious and pay attention to what they put into their bodies. Many consumers that were researched did not have any specific diet restrictions nor did they claim to be lactose intolerant. The level of fat within the diary product is the most important point to consumers, while sugar is the most imperative for the nondairy beverages. Over 70 percent of the dairy milk that was sold in 2014 was that of fat-free milk. So it stands to reason that the taste of such selections would actually cause the amount of milk that is purchased in subsequent grocery visits to go down. The most common substitute for diary milk is almond milk. 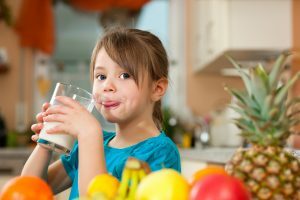 We found that consumers choose milk based on habit or because they like the flavor, explains lead author on the study Kara McCarthy. Milk that is appealing in flavor could convince nondairy beverage drinkers to consume more diary milk; likewise, lactose-free milk or milk from grass-fed cows might also be more appealing. She brings up a good point here as the dairy isn't always the conflicting issue. Sometimes the cows are fed so poorly that the milk becomes almost impossible to digest. When the milk becomes impossible to digest, then that becomes an issue of the consumer believing that they are simply allergic to milk when that isn't actually the case. If the taste as well as the internal reaction of milk that comes from grass-fed cows was altered, it stands to reason that the amount of milk that would then be sold would increase. The amount of understood health benefits and taste are the foremost deciding factors that consumers take into consideration when buying beverages overall. Health benefits become more obvious if the body has an overtly negative reaction to ingesting a certain product. But the health benefits of something that is high in sugar are actually nonexistent so this can be deceptive simply because it tastes good. Taste and health are not mutually exclusive. If that was the case, we would be talking about how soda is healthy when there have been countless studies that it is not, regardless of how good it tastes. Working through the variables and what influences the pocketbooks and spending habits of consumers when they are doing their weekly grocery shopping comes down to what works best in their bodies and what is pleasing to their taste buds.